Conan Exiles is a survival game set in the Hyborian Age, Robert E. Howard’s Conan the Barbarian universe. After being one of the unlucky ones fated to die at the hands of the desert via Crucifixion, you are given a second chance and left alone to survive the harsh Exile lands. Just like other survival games before it, you start with nothing but a waistcloth to cover your character's 'parts'. You pick up various materials from the land, using them to craft items in order to survive. You must drink and eat to stay alive and build or find shelter in order to be protected from the harsh weather conditions of the land. Meeting these basic needs will soon become second nature, since maintenance isn’t difficult. Food can be found everywhere, and simply hitting a river is enough to quench your thirst. The real dangers are the animals and other people (especially in PVP servers). Every tier in one attribute gives a passive skill, so you'll have to decide where you want your character to focus on. The game provides simple objectives to aim for, the accomplishment of which nets you a good amount of experience. These tasks can be as simple as drinking water, crafting a specific item, to finding a friendly NPC to interact with. While I was playing, I found myself ignoring them because I found enjoyment in different aspects of the game. I found myself focusing on specific tasks during each session. In one, I dedicated myself to home building. Another session was all about my journey to the east side of the map (it didn’t go well). The next day, I had a simple agenda - steal items from other player's homes (I was hunted down when they found out). The point is, there's a variety of ways to enjoy this game. My base of operations on the right. The one on the left? A player that seemed hostile. The land of Conan Exiles is massive and populated. Caves and dungeons can house rare materials, and massive creatures can be seen roaming the land - predators or prey for those confident in their equipment and abilities as a fighter. There are different locales, each with their own unique challenges and sets of items, and one feels encouraged to visit each region to find the materials you'll need to make progress. There are level-ups, and most of everything that can you do in the game results in experience, even just staying alive. Leveling up gives you allottable stat points to improve your character - you can opt for increased melee damage to an increase in stamina, for example. Trait points are available and are used to unlock new recipes for building items, upgrading crafting stations, and modifying weapons and armor. Conan Exiles has a Thrall system - allowing players to convert enemy NPCs to work for you. This allows one to populate the home they’re creating for themselves. After simply beating an NPC with what i'd like to call a 'Submit Club', then dragging the unconscious NPC to the 'Wheel of Pain', it will take hours converting one individual for your cause. While the idea of building my army of Thralls was exciting, the limitation of having just one ally able to join you in your travels can be discouraging. Having Thralls defend your home while you're offline doesn't seem worth it either, since AI is horrendous and easy to exploit. At best, Thralls are used to man crafting stations to give you access to better versions of certain items and equipment. You can play Conan Exiles offline, and Funcom has provided three difficulty settings to choose from. In Multiplayer, servers are divided between PVP and PVE. Each server can house 40 players each, but the lack of a queue system is a big issue that hopefully gets addressed soon. I've experienced various instances where I could not play on the preferred server housing my character. In the instance of a PVP server that allows players to raid other people's house, I got anxious thinking that I could not defend or check on all my work, simply because the server was full. Some basic features are lacking, and fixing these would go a long way in helping players enjoy the game in the long run. Conan Exiles is filled with bugs and issues, but it's a better game in terms of quality compared to its Early Access release last year. Combat is simple. Left clicking dishes out light quick attacks, while right click has special attacks depending on your weapon. There are various enemies to fight, but I found that most of them were, again, easy to exploit. 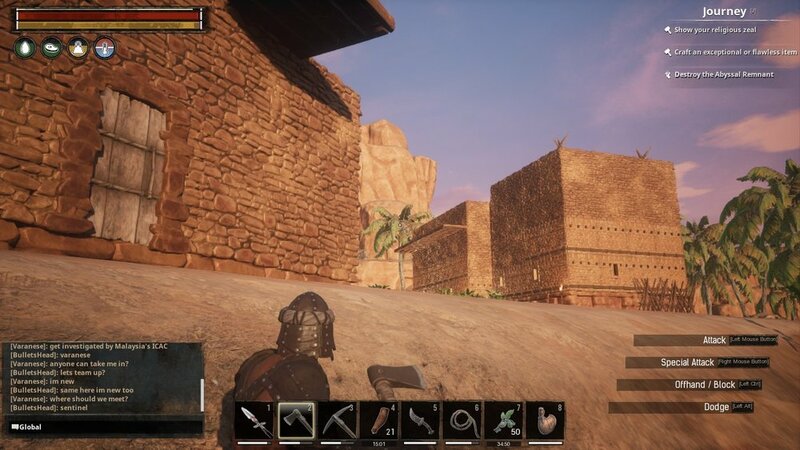 I would say that standing on top of a foundation block that I just built and poking an enemy that cannot reach me isn't the ideal Conan Exiles experience. In the end, what Funcom has provided is a survival game that feels complete, with a lot of potential to grow a stable and strong community. 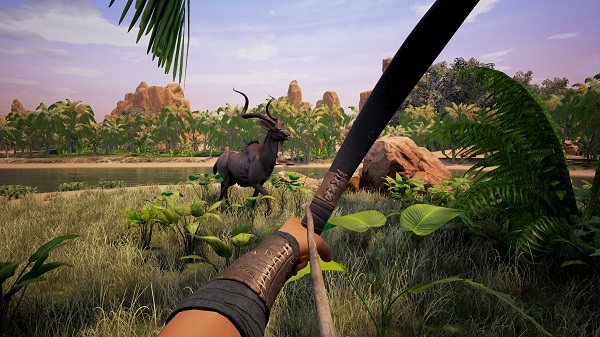 The bugs and the lack of certain quality of life features will turn off many, but this is a game that can easily satisfy your creative side, while allowing you to craft your own personal adventure within this brutal world in Conan Exiles.